How does the US Dollar Affect the Gold Price? The US Dollar and Gold Price share a special relationship, traditionally, when the dollar value moves, the gold price… runs the other way! The United States Dollar is regarded as a global currency, familiar and accepted as a form of payment in many countries around the world, over the past sixty years through strength, familiarity and consistency, the US Dollar has achieved status as the World Reserve Currency. So why, when the US dollar weakens, does the gold price (and to some extent the silver price) tend to move in the opposite direction? 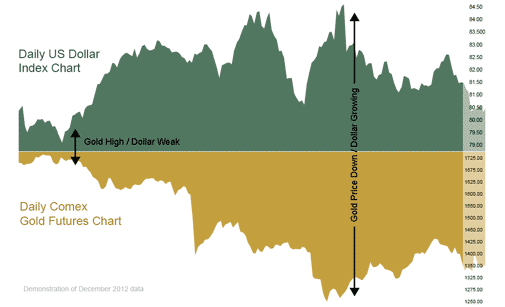 What are the other primary drivers of the gold price? Gold and… Inflation - Gold is considered the ultimate anti-inflationary-tonic, as inflation takes hold and the dollar devalues, investors look to hedge against the dollar losses through rock solid gold. Gold and… Deflation – Just as the gold price thrives during times of inflation, deflation will take the wind out of the gold price as the dollar strengthens and investors regain confidence. Gold and… Interest Rates – Gold will shine through when interest rates are low, lack lustre investment performance from savings and bonds tend to drive investors towards the precious metal. In times of very low interest, savings can effectively lose money as inflation exceeds investment performance! Looking for more gold price information? Kitco offer a large range of precious metal charts, analytics and analysis.